DB Sports Tours is delighted to announce an exciting new partnership with the Schoolboys Football Association of Ireland. The partnership will see DB Sports Tours become the preferred travel partner of the SFAI. 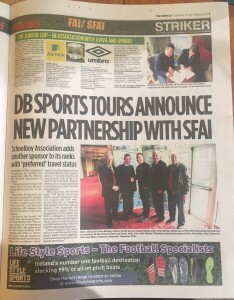 Since 2010 DB Sports Tours has been successfully managing the travel plans and trips for many Leagues and clubs within the SFAI and this new partnership will enhance the growing reputation of this Irish company.